Categories: Andal, Azhwars, Divine Names, Mahans. 3.What is the other name for Andal? 4. Under which plant was Andal first seen by her father? 5. Apart from Thiruppavai, what is the other set of Pasurams that was composed by Andal? 6. 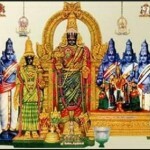 On which day of the Aadi month is Aadi Perukku celebrated? 7. Which river in Tamil Nadu is generally worshiped on the day of Aadi Perukku? 9. Aadi Pooram festival is generally celebrated with a divine wedding. Name the Divine Couple for whom the divine wedding is performed.